Ettore Sottsass was a very interesting designer who made a lot of unusual stuff, including this wacky item, yes, wacky, that’s a word in the English language, unfortunately. This wacky bookcase/divider/dresser, the Carlton, as it is known, is one of Ettore’s creations. What a lovely scratching post it offers to the discerning ‘hyper-carnivore’ (to quote Abigail Tucker, that writer of wonderful books about cats) that is the mid-century modernista feline. 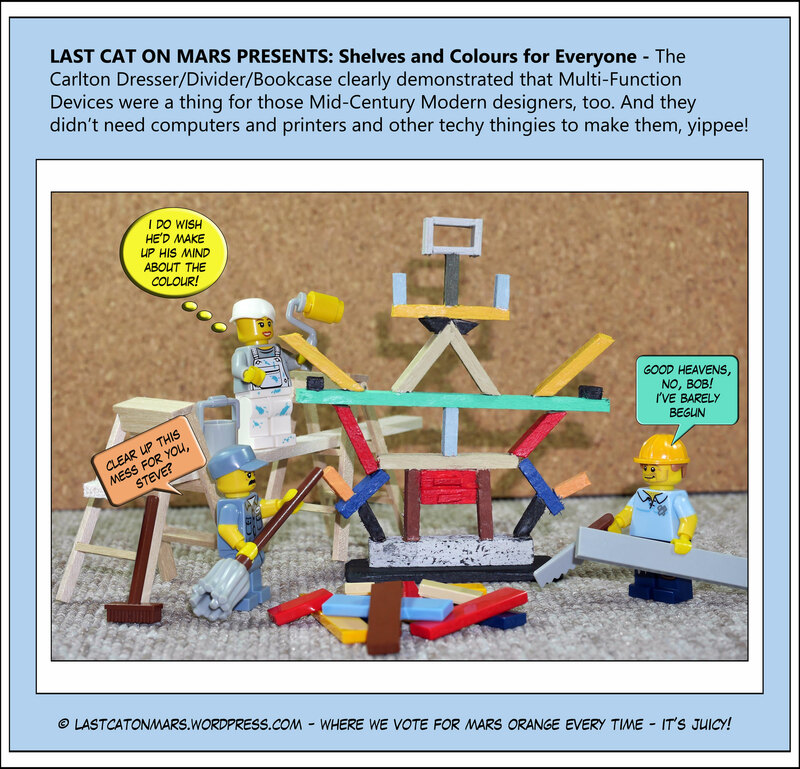 This entry was posted in History, Sculptures and tagged cartoon, comic, design, Ettore Sottsass, lego, mid-century modern, minifigures, sculpture on July 11, 2018 by Jay Verney. I know, but I like tiny houses of almost any kind. I’m a cat, what can I say? We love small, snuggly places that can also relocate quickly when a family of canines moves in next door. What do you think of the tiny house revolution, friends? Want one? Envious of Peter and Daphne? Don’t worry, they’re about to find out what owning two very hungry equine types involves, especially in terms of, shall we say, clean up! Good luck with that when you don’t have a litter-box big enough – hahahaha – ha! Constant tiny house movement, that’s the ticket. 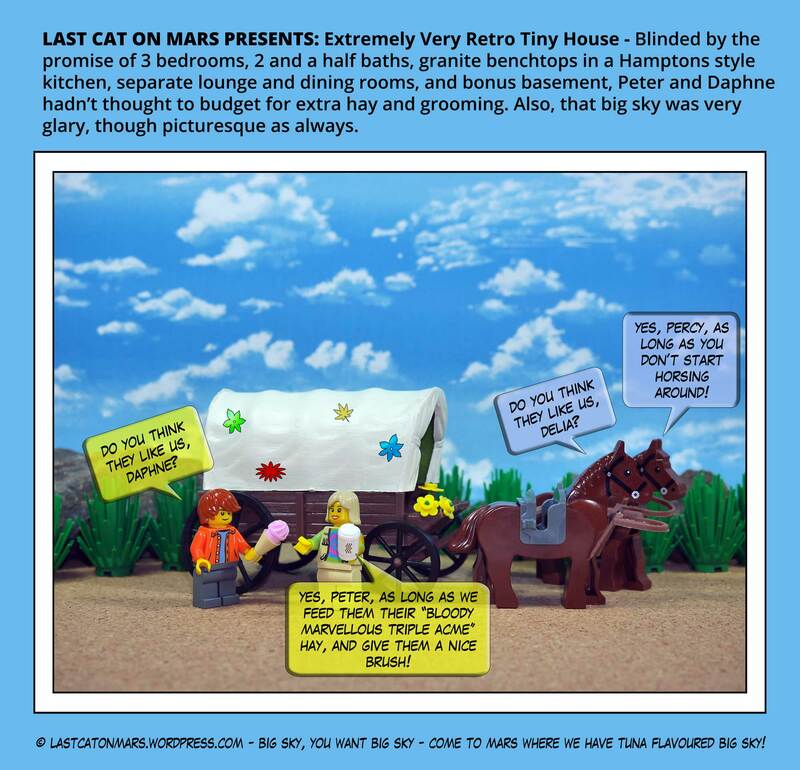 This entry was posted in History, Variety Show and tagged big sky, cartoon, comic, covered wagon, horses, lego, minifigures, retro, tiny house on November 29, 2017 by Jay Verney. 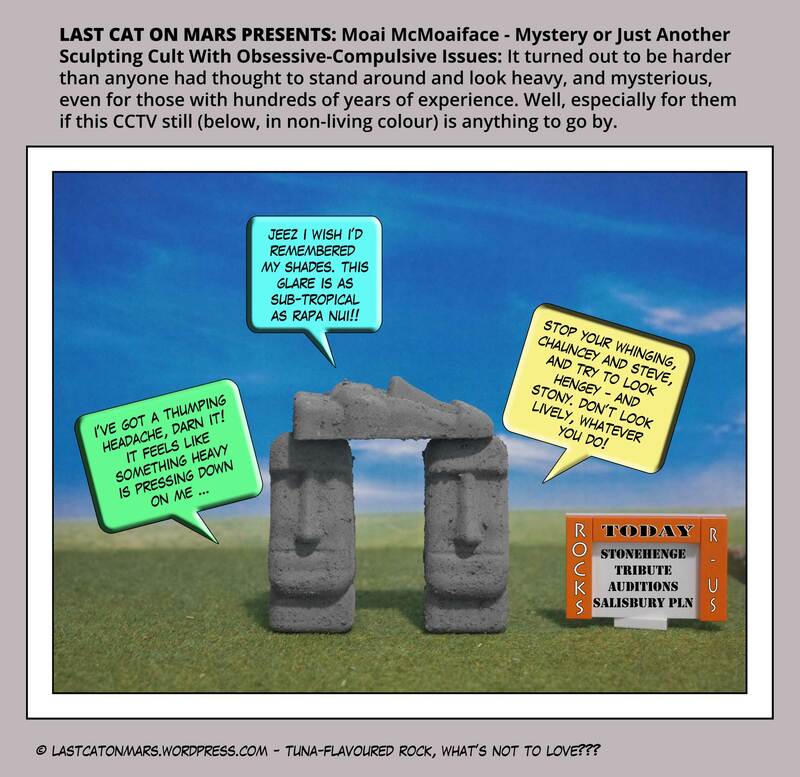 The Moai are one of my favourite mysteries of the world – if only we had some here on Mars – or maybe we do – cue thrilling music with a little vibrato. Well, I suppose there’s a lot of information about them, and mystery may be stretching it a little. But one has to wonder why the esteemed sculptors kept making the great big heads when all around them was going to hell, not to mention treeless, foodless, and tuna-less. Ordering pizza was not an option. On the plus side, we still have nearly 900 of the gigantic beauties to ponder over and admire. 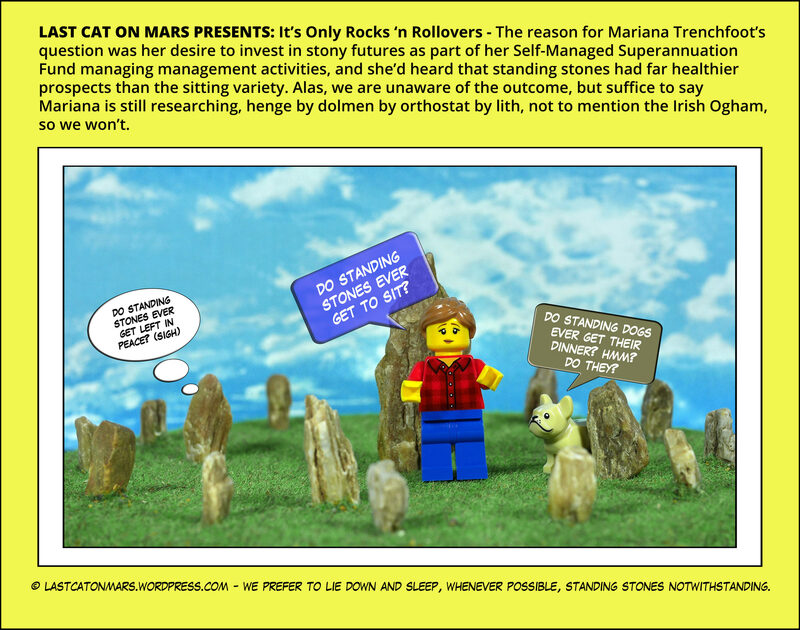 They’re monoliths, you know, and were responsible for thriving physiotherapy businesses on Rapa Nui (not a true fact, but perhaps an alternative fact – hahahahahaha). 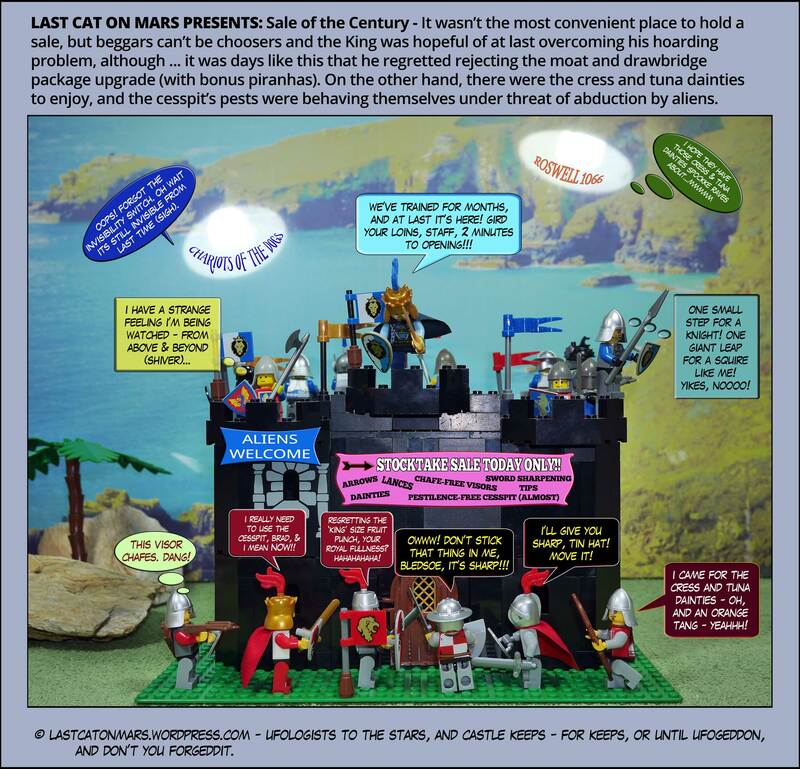 This entry was posted in History, Variety Show and tagged cartoon, comic, Easter Island, Moai, Rapa Nui on October 4, 2017 by Jay Verney. I’ve always been a big fan of castles and, in particular, the Hollywood castles frequented by that delicious fellow from Tasmania, Mr Errol Flynn. Remember him in The Adventures of Robin Hood? Does it get any better than that? Only if you have tuna-flavoured dainties to nibble as Robin and Maid Marian (the equally lovely Olivia de Havilland who just celebrated her 100th – you read me – 100th birthday – she lives in Paris – Happy Birthday Ms de Havilland, hope the tuna cake was spankingly great) – where was I? – yes, as they ride off to their honeymoon on the Great Barrier Reef where the castles are scarce but the Longtail and Yellow fin tuna are swimmingly abundant. 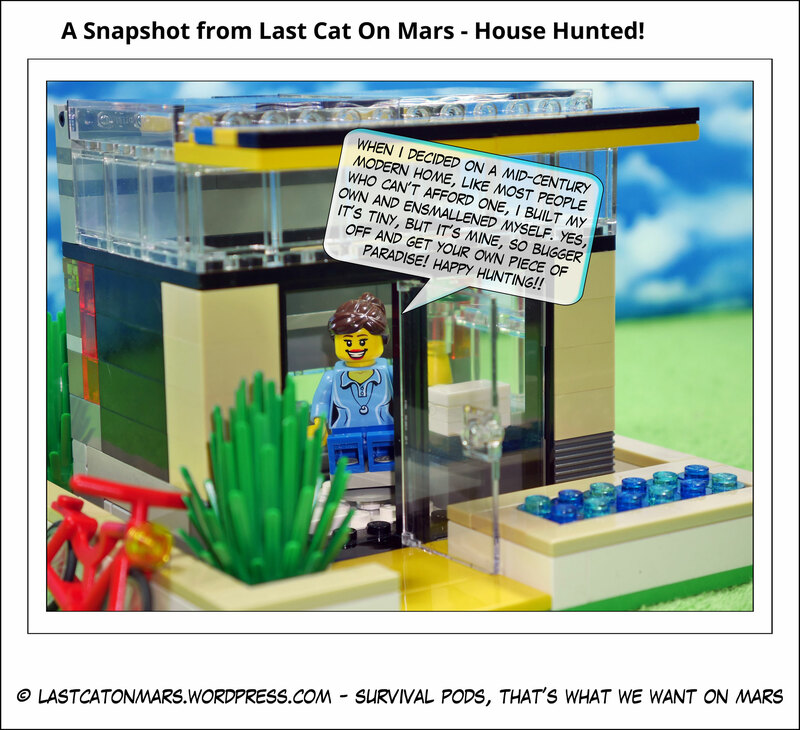 This entry was posted in History, Variety Show and tagged aliens, cartoon, castle, comic, Errol Flynn, king, knights, lego, minifigures, Olivia de Havilland, Robin Hood, sale, tuna, ufo on July 13, 2016 by Jay Verney.